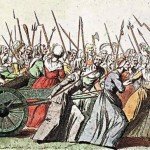 In October 1789, thousands of Parisians, many of them women, embarked on a 12-mile march to Versailles, the residence of Louis XVI and the National Constituent Assembly. Those who participated did so for different reasons. Some were desperately hungry and hoped to petition the king to alleviate bread shortages in Paris. Some had more violent intentions, seeking retribution against the king’s soldiers or his wife, the much-despised Marie Antoinette. Others wanted the plead with the king to leave Versailles and return to Paris, where he would be away from what they perceived as the corrupting influences of the aristocracy. After 24 hours of tension, intimidation and some violence, the king and the Assembly agreed to leave Versailles and accompany the mob back to Paris. The October Days, as this period is known, brought a century of royal government at Versailles to an end. Not for the first time or the last, threats of violence had produced a significant political shift. France’s monarch and national government relocated to Paris and became subject to groups and forces within the capital. Like many of the revolution’s fateful journées, the October Days were triggered by provocative rumours. On October 1st 1789, soldiers of the Royal Flanders Regiment arrived at Versailles from Douai after being summoned to strengthen the king’s royal bodyguard. 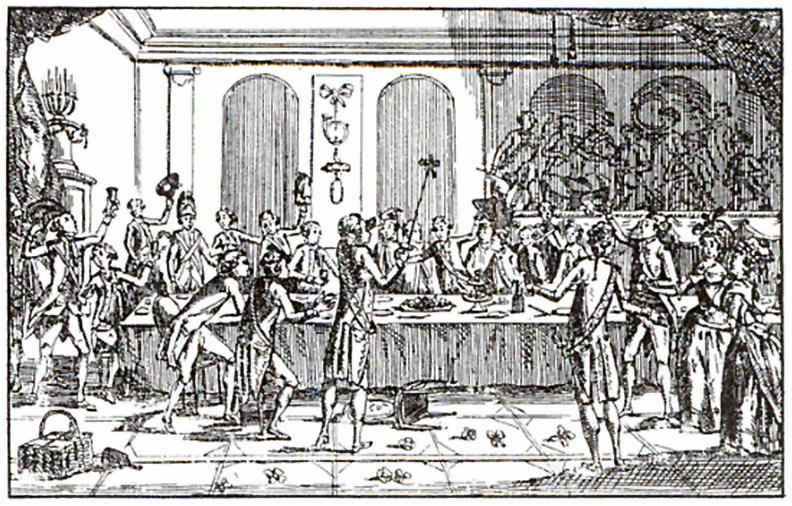 The royal court provided the regiment with a welcome banquet which, according to eyewitness accounts, became progressively rowdier as the soldiers consumed more wine. Late in the evening, drunk soldiers were reportedly seen standing on tables, shouting and singing bawdy songs. All this was probably harmless enough but the popular press in Paris seized on it nevertheless. According to Jean-Paul Marat‘s L’Ami du Peuple, drunken soldiers had insulted the revolution by throwing tricolour cockades onto the floor, then stomping and urinating on them. Some officers, Marat claimed, had also donned black and white cockades of the Ancien Régime. It was said the soldiers sang verses of O Richard, ô mon Roi!, an operatic song praising an imprisoned king and calling for his freedom. 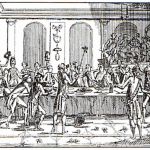 Louis XVI himself had attended the banquet earlier in the evening, albeit briefly – however reports in Paris claimed he had stayed for hours, watching the proceedings with both approval and amusement. Some publications pondered why royal soldiers were permitted to eat and drink heartily at a time when ordinary Parisians could scarcely find a loaf of bread. These reports, along with rumours of more debauchery at Versailles, caused outrage among the working people of Paris. By October 4th Parisians were taking to the streets in protest, not just about the conduct of soldiers at Versailles but also a chronic shortage of bread and other foods. The harvest had been gathered in September so supplies should have improved – but this had not eventuated in Paris. The government of Jacques Necker, anticipating a shortage of food, had negotiated imports of grain – but these had not yet arrived. Bread queues outside bakeries stretched for entire city blocks. Many Parisians queued for hours, only to go home empty-handed. The shortages of bread in early October were unexpected and gave rise to conspiracy theories. Some suggested that the king and his ministers, having lost power to the National Constituent Assembly, had orchestrated the food shortage to starve the people into submission. This idea was perpetuated by the radical militia leader Claude Fournier L’Héritier, who claimed: “the detestable aristocratic and royalist horde had plotted to submit the nation to slavery by starvation”. By October 5th, the situation in Paris had reached critical mass. That morning a crowd of between 5,000 and 10,000 people gathered outside the Hôtel de Ville and demanded the city release its supplies of bread. 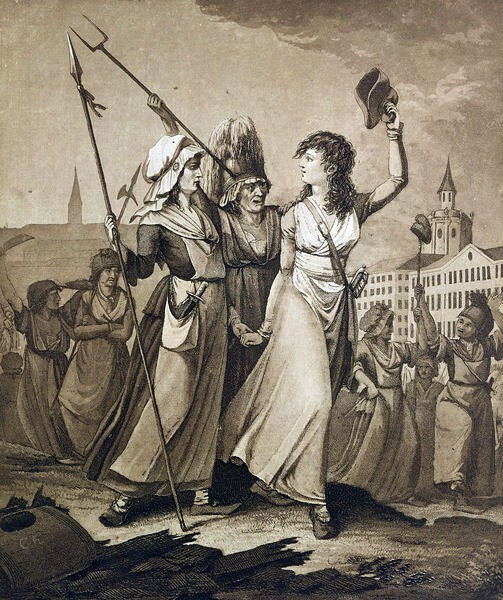 Many of the crowd were women from the unruly district of Faubourg Saint-Antoine; a sizeable number were veterans of the attack on the Bastille three months earlier. When the Commune did not respond, the crowd elected to march on Versailles and take their grievances directly to the king. Armed with pikes, scythes, clubs, muskets and some small cannon stolen from the Hôtel de Ville, they marched out of Paris at noon and trudged the 12 miles to Versailles, arriving shortly after dark. Their de facto leader was Stanislas Maillard, a coarsely spoken officer in the National Guard and one of the leaders of the July raid on the Bastille. The crowd had conflicting aims but there was a general consensus that the king must return to Paris and address the food crisis. An account of the October Days by Adrien Duquesnoy recalls that “ten, twenty, thirty thousand people were coming to Versailles, intent on seizing the king according to some, seeking to force the [National] Assembly to hasten its work, according to others”. Meanwhile, the Assembly’s president, Jean-Joseph Mounier, arranged for a deputation of six women to be admitted to the palace. The king heard their case and promised to take action to alleviate the food shortages in Paris. When his promises failed to calm the agitated mob, Louis ordered the food stores at Versailles be opened and distributed to the protestors. By this time Marquis de Lafayette and a regiment of National Guard had arrived from Paris, however the king preferred not to deploy the Guardsmen or his own soldiers, perhaps fearing a bloodbath. Instead, Louis delivered a message to the crowd, promising that he would endorse the Assembly’s reformist legislation and give his assent to the August decrees and the Declaration of the Rights of Man and Citizen. The night passed with some sporadic gunfire but little violence. The soldiers were given no orders to fire on civilians and many soldiers openly mingled with them. 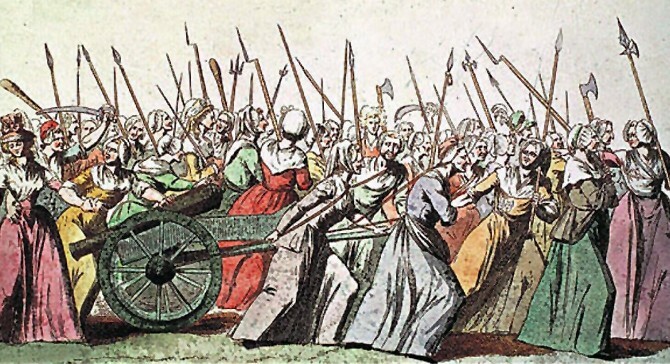 One radical section of the crowd, comprised mainly of women from Faubourg Saint-Antoine, had been demanding stronger action since their arrival at Versailles. They refused to accept the king’s assurances, claiming that whatever he promised now would later be reversed by Marie Antoinette. Around dawn on the morning of October 6th, this group gained access to the palace through an unguarded side entrance. They stormed through the palace halls, intent on finding and murdering the queen. When a sentry spotted the women and fired on them, killing one, the mob overpowered, murdered and dismembered two soldiers. Antoinette avoided the women by fleeing through the palace’s maze of bedrooms, which probably saved her life. Additional soldiers were mobilised to restore order and clear the palace of invaders. 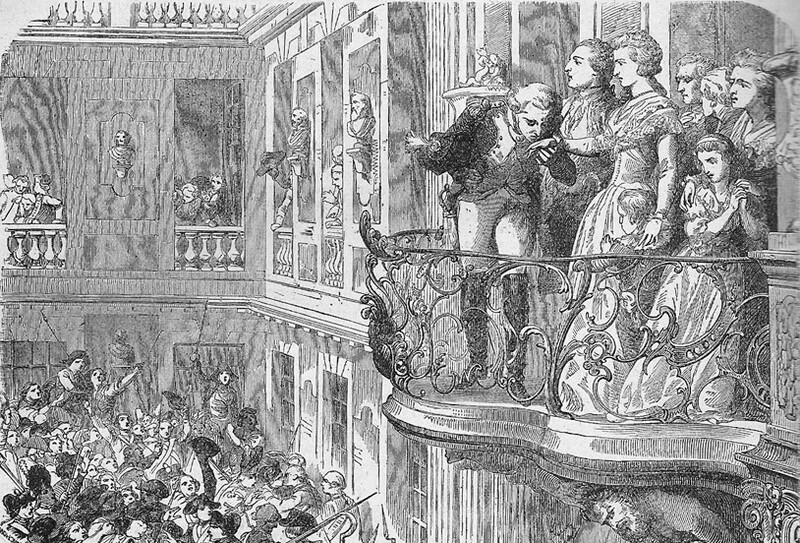 On Lafayette’s advice, Louis XVI addressed the largest section of the crowd from a window balcony. “My friends”, he told them, “I shall go with you to Paris, with my wife and children. It is to my good and faithful subjects that I confide all that is most precious to me”. These remarks brought cheers, applause and shouts of “Vive le roi!”, as did the king’s gesture of wearing the tricolour cockade of the revolution. 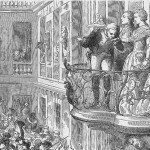 Louis departed the balcony and was replaced by Marie Antoinette, who bravely risked her life by standing before the crowd, some of whom were armed with muskets. On the afternoon of October 6th the king, his family, his royal retinue and several deputies to the Assembly departed Versailles for Paris. Their carriages were accompanied by the crowd, the procession numbering between 30,000 and 40,000 people. The mood of the people was joyous and optimistic, yet also triumphant and intimidating. On July 14th the people had triumphed over royal absolutism; on October 6th they had triumphed over the king himself. On their return to Paris, the royal family was installed in the Tuileries, a dilapidated palace not used as a royal residence for decades. Some furniture, clothing and other royal belongings were carted from Versailles to the Tuileries; even so, the royal court in Paris was much more austere. Versailles was maintained, an acknowledgement that the king might someday return, however, neither Louis or his family would see the splendour of Versailles again. The National Constituent Assembly also relocated to the Tuileries, its sessions held in the Salle du Manége, an indoor hall used for riding lessons. The king became a virtual prisoner in the Tuileries and, in many respects, the revolution became a prisoner of Paris. 1. 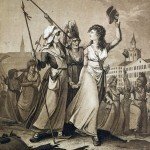 The October Days refers to the journée of October 5th and 6th 1789, when a crowd of several thousand Parisians, many of them women, marched on Versailles to pressure the royal government. 2. Located 12 miles from Paris, Versailles was a sprawling complex of palaces and buildings that housed the king and the royal government since the days of Louis XIV. 3. The march on Versailles was precipitated by severe food shortages in Paris, then rumours of a banquet given to royal soldiers on October 1st, where drunken soldiers allegedly trampled symbols of the revolution. 4. 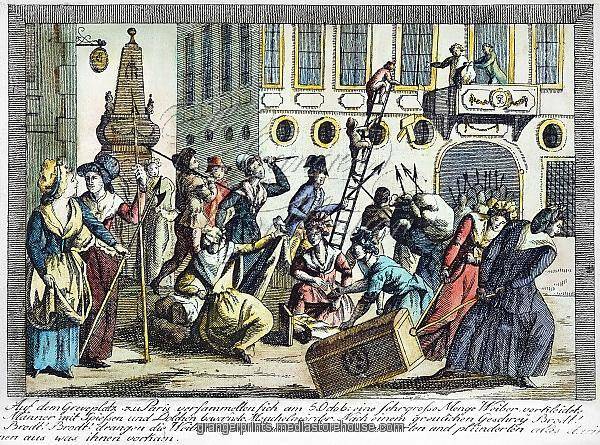 During the October Days, as many as 30,000 people laid siege to Versailles and petitioned the king and the National Constituent Assembly. Some even penetrated the palace and threatened Marie Antoinette. 5. On October 6th Louis XVI appeared before the crowd and agreed to return to Paris. The royal procession, accompanied by Assembly deputies and the crowd, departed Versailles later that day. 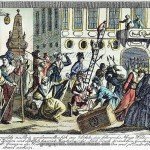 J. Llewellyn and S. Thompson, “The October march on Versailles”, Alpha History, accessed [today’s date], https://alphahistory.com/frenchrevolution/october-march-on-versailles/.